What are you planning for your Christmas dinner? Foie gras is a must for all Christmas dinner in France. I have never had a single Christmas dinner without foie gras. You can serve it the classic way a slice of foie gras on toast or you can be inventive. 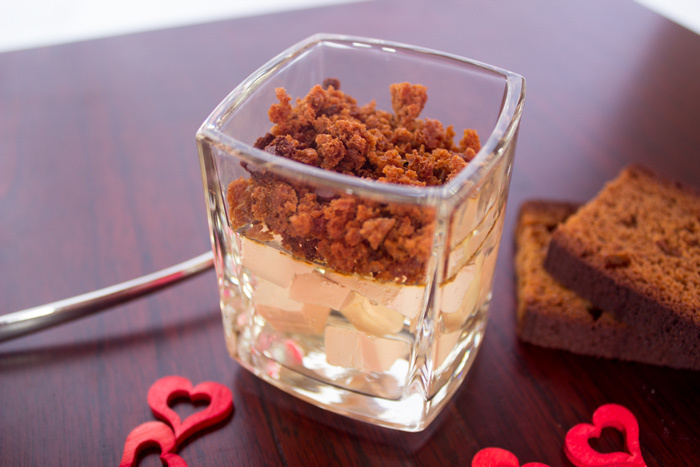 This verrine associates foie gras with gingerbread and Gewurztraminer. The Gewurztraminer is a white wine coming from Alsace, in France. Belonging to the “noble wine” family, this white wine is one of the more aromatic and fruity wines of the Alsace region. You can also use some Muscat or Sauternes instead of Gewurztraminer. It depends on your taste and which wine you will be able to find in your supermarket. Dice foie gras and refrigerate. Put sheets of gelatin in a bowl with cold water and ice cubes. Bring water and gewurztraminer to a boil in a medium pan. Remove from the heat and add gelatin sheets. Stir gently and leave to cool for few minutes. Add jelly in your verrines and place in your fridge for 10 minutes. Then add the dices of foie gras. Refrigerate for at least two hours. 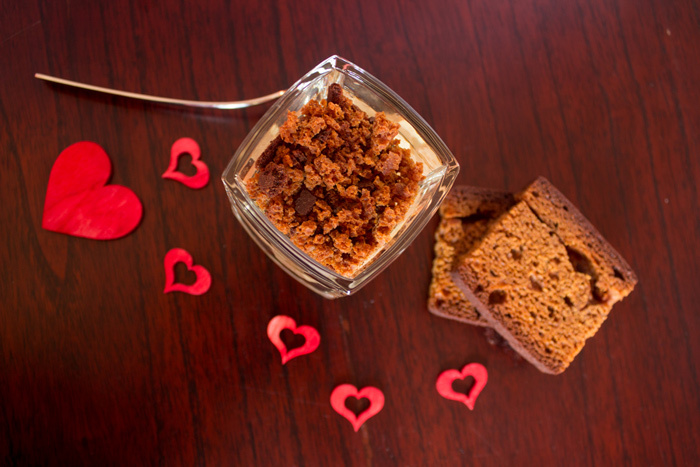 Crumble gingerbread slices. Heat a non sticky pan, melt butter and brown gingerbread. Cover jelly with gingerbread and serve. If you want to find out more ideas for your verrines, you might be interested by the verrine recipe index.